“River’s Gonna Rise” by Warren Haynes plays in the kitchen of First Congregational Church in Clayton, Missouri, where a group of volunteers that call themselves PotBangerz laugh and chat as they chop 40 pounds of chicken, boil noodles and cook vegetables. For Cathy Daniels, better known as MamaCat, this January gathering is a joyous occasion. Tonight, just as she does every Thursday, MamaCat will lead the PotBangerz in delivering the meals to the St. Louis residents whom MamaCat refers to as her unhoused family. MamaCat shows off her dance moves, her energy vibrant and infectious, earning grins from the volunteers around her. Some of the PotBangerz folks have been doing this for a while, so they know the drill — chop, dance, cook, sing, love, grace. MamaCat pauses her dancing to slice into some chicken with her expert knife skills before explaining why sharing meals is so essential. Sharing meals nourishes the heart as much as the body, MamaCat believes. When someone offers bread or when people eat together, there’s an acknowledgement of dignity, of humanity. Around a plate of food, everyone’s an equal. 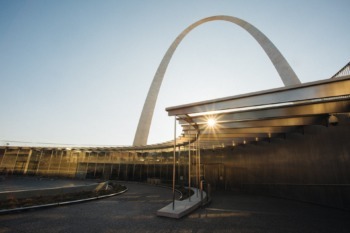 That’s important when connecting with unhoused individuals, of whom there are an estimated 1,300 in St. Louis. A little love goes a long way. MamaCat has been there, herself. “Back in 1989, I was living on the streets with my children. I know what this is,” she says. MamaCat hugs two of her young PotBangerz volunteers. MamaCat founded PotBangerz as a culmination of lifelong themes of family, food and resistance. She grew up in New York City as the tenth of 11 children, with parents who engaged in protests and sit-ins for civil rights. Today, she carries on the legacy of standing up and speaking out by participating in Black Lives Matter actions and heading to Tornillo, Texas, to cook for people protesting family separation at the largest shelter for migrant children in the United States. 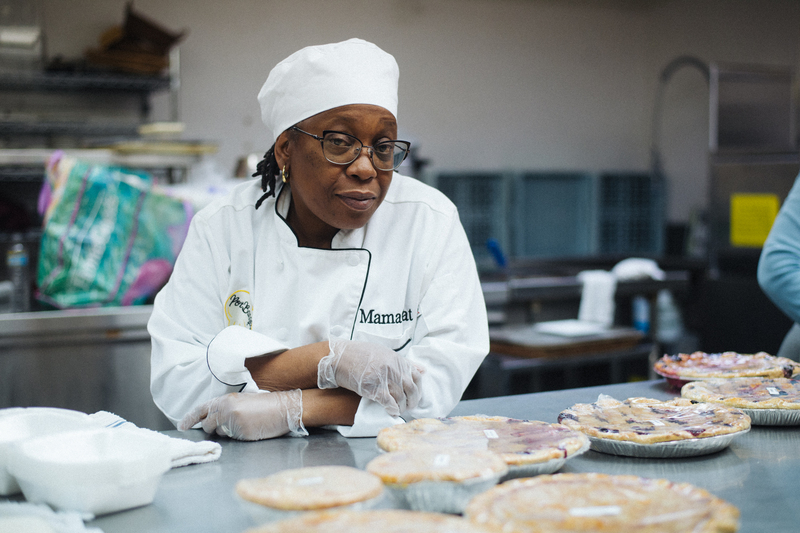 As a young woman in New York, MamaCat had attended a vocational high school where she completed the food and maritime program, but she wanted to build her culinary skills even more so she headed to the Culinary Institute of St. Louis at Hickey College. She was a great-grandmother by the time she graduated – she had four children of her own who have given her seven grandchildren and one great-grandchild. Now MamaCat surrounds herself with two additional families – her fellow PotBangerz volunteers and the people she serves. 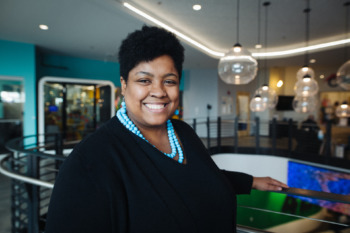 Although she’s only lived in St. Louis since 2012, she already has amassed an expansive network of folks who she’s brought together and worked with. “We have resistance in common,” MamaCat says with a smile. Since 2015, MamaCat and the PotBangerz have prepared meals for the unhoused community every Thursday, along with cooking for events that bring the community together, like the annual Neighbors United block party and holiday party. It all stems from MamaCat’s desire to use cooking for others as a way to help them heal. 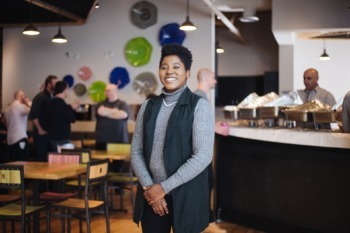 She defines the meals she cooks as repasts – “people coming together and just bringing their strength, their great energy, their love,” she says. One of the first repasts she prepared was in Christ the King United Church of Christ in Florissant for the family of Antonio Martin, who was killed by a Berkley police officer on Dec. 23, 2014 – four months after Michael Brown was shot by a police officer in nearby Ferguson. “When I got out there, I seen his mother. She just looked so lost, you know?” MamaCat and her husband lost a child twelve years ago, and she has great empathy for other mothers who have had to bury their children. “I just felt that I needed to make sure them families was okay. We would cook. We would do these repasts. We’d try to give these families a place to begin their healing process,” she says. To date, she’s been part of 48 repasts for families who have lost loved ones. After a repast in 2014, MamaCat and her team took their extra food to a vacant building where a community of unhoused people were living. It’s the action that eventually brought PotBangerz to fruition. “That’s how we found our family out there. Over these years, we built relationships,” MamaCat says. Some of the people she’s served have since found homes, and some have even come back to volunteer with PotBangerz, serving meals with MamaCat every Thursday. “The best revolutionary act ever is love,” MamaCat says. Back at First Congregational Church, the PotBangerz volunteers, who range from pre-teen to 82 years of age, are pulling together the final elements for the meal they’re preparing. The predicted low temperature for this wintry evening is in the single digits, so along with a hearty chicken dinner and some snacks, MamaCat and her volunteers will offer gloves, hats and hand warmers to those without homes tonight. “We head to where the people are,” MamaCat says. Tonight they’ll start at a pop-up shelter, sharing information about resources and warming centers while chatting about how things have been since they had last connected. “You can talk, or you can do. The city leadership does a lot of talking. The community does the doing,” MamaCat says. Do you or your organization want to help MamaCat? Here are a few ways to spread the love. Follow MamaCat’s efforts on Facebook. Sign up to volunteer with PotBangerz. Contact PotBangerz to donate (food, supplies or funds).